In creating baby + me, we spent lots of time thinking about activities to help prepare soon-to-be big brothers and sisters for a new baby. Looking at baby + me, you’ll see we value drawing highly, as it can provide a window into a child’s thoughts. 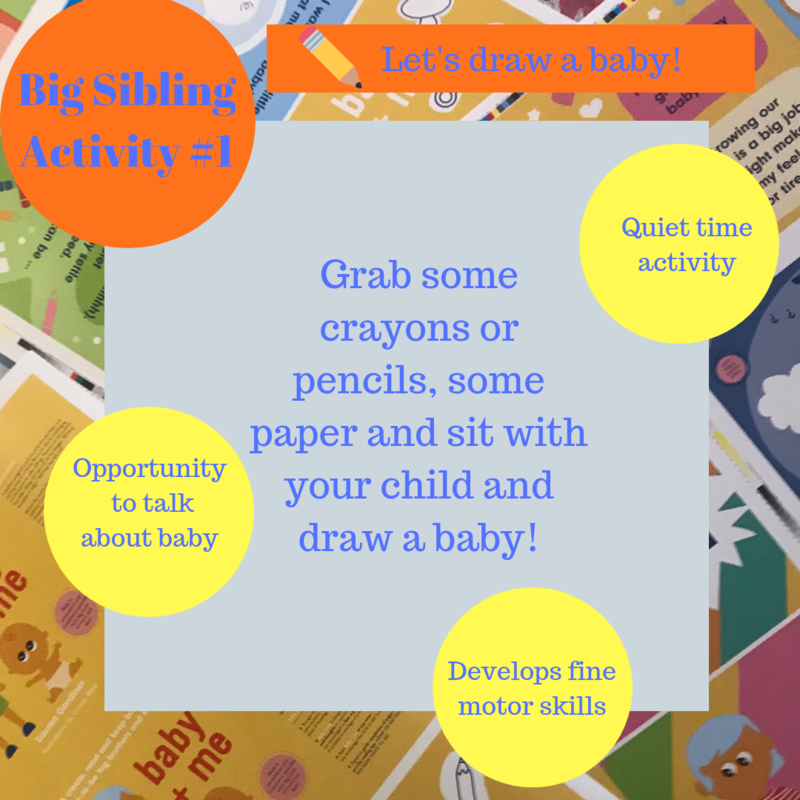 This activity called “Let’s Draw a Baby” is a great big sibling activity – it provides an opportunity to talk about the baby (their physical make-up, their capabilities and needs); it helps develop fine motor skills; and, it’s a great bonding activity (and, if the child develops an interest in drawing, it can be a go-to activity when the new baby arrives). This blog includes tips for doing (or modifying) the activity to suit you and your child. These tips come from my own experience as a mum and draw on the knowledge and expertise of Debbie Isaac, the consultant paediatric occupational therapist on the baby + me book. It seems young, but children from 1 year of age can be encouraged to hold a crayon or pencil and draw. I’ve just started Miss Gubby (15 months’) with crayons. She’s now spending more time at it and filling the page with more and more colour. To be completely honest with you though, if I’d read this post six years ago when I was pregnant with our second boy, Dames and had Little Mate (then just a year old), I probably would have found another source of inspiration for big sibling activities! Worse still, I probably would have worried and even felt guilty about the fact that Little Mate thought crayons were for chewing (or throwing) and paper was for scrunching. Little Mate was not really interested in writing, drawing or talking. Outdoor activities, playgrounds and riding on trains were his thing! But fast forward to now and Little Mate (now age 7) is full of words and fills not only my ears but also any piece of paper he can find around the house with words and drawings. Often he will get home from school and launch straight into a creative project – writing a book, tracing a picture, doing a painting. do it together – drawing is a great activity to share! even if your child is older and more capable, a blank page can give a child “stage fright”, so consider starting the drawing off yourself. For that reason, the baby + me book does not have any completely blank pages in it! Even my Dames, who has loved drawing since he was very young, has got stuck starting a drawing from scratch! try foot prints or hand prints as a starting point for a baby picture. These are always popular with the little-ones and, even if they are not holding the pencil or crayon, they feel involved in making the picture by having their hand traced around! and finally, try not to put pressure on your child (or yourself!) – drawing should be fun for both adult and child. You can always come back to it another day! We’d love you to try “Let’s Draw a Baby”. Please tell us how you and your child go (pictures too please)! Good luck and happy drawing! baby + me, a new and unique book for soon to be big brothers and sisters that helps them prepare for a new baby, is Lauren Gardiner’s first book. In this blog post she talks about why she wants to write for children and hopes that it will inspire you to share a book with a child, or even pick up a pen or your computer keyboard and write a story yourself! The story behind baby + me and Lauren’s inspiration for it will be covered in a later post. 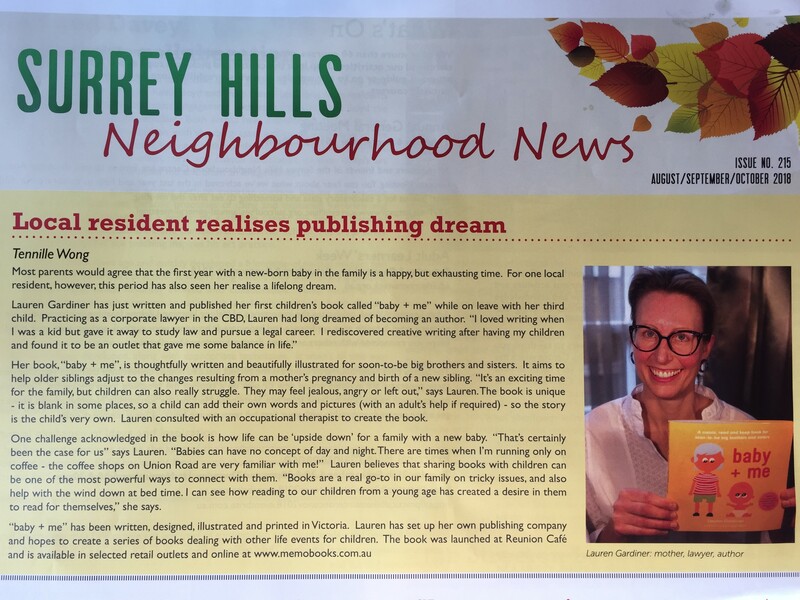 I reflected on my motivation for writing for children last week when I had the privilege of opening a book launch event for the Year 6 children at Our Holy Redeemer School in Surrey Hills as part of their Book Week 2018 celebrations. The children had each written, illustrated, covered and bound by hand a picture story book. The books are bright and engaging. Some are humorous. Others are very touching – about family, friends, feelings. An incredible amount of time, thought and effort has been spent on them. The children are now on tour – reading their books aloud to the other classes and to children at local kindergartens. In the address I gave, I focused on my own motivation for writing for children, because I think it demonstrates the incredible thing these children have achieved. The image that motivates me to write for children is an image that I am part of almost every night in our house. In our house we choose a kid’s bed and we snuggle and we cuddle and our legs go this way and that way and we read books together. We read the story and talk about the pictures and we enjoy this special wind down time together. But books are also a “go to” for our family at any time of the day – not just at bedtime. Sometimes we grab a book after school when the kids are tired or things are a bit rocky. A child who’s feeling a bit on the outer, maybe a bit upset, slowly warms to the idea, maybe listening from afar in the beginning, but slowly edging closer and closer. Ah…the magic of a book to calm and to gather in close! Books have also helped our kids understand their feelings and to express them (see Trace Moroney’s When I’m Feeling… books). They’ve helped us with school and kinder transitions and other tricky transitions too, like toilet training. I have no doubt that reading to our kids from a young age has helped them with their reading at school – it has sparked an interest in books that has made it so much easier and more natural for them to find the tools they need to read for themselves. I remember not knowing what else to do with our eldest child, known here as Little Mate, in those early days. We’d done tummy time, already gone for a walk, sung my total repertoire of nursery songs (badly!) What next to do with a newborn? Answer: read books! To me, books are magic. They give gifts to readers – to children, to adults and to families. The magic of books is that – while they are made up of two-dimensional images – how we experience a book is so much more than that. 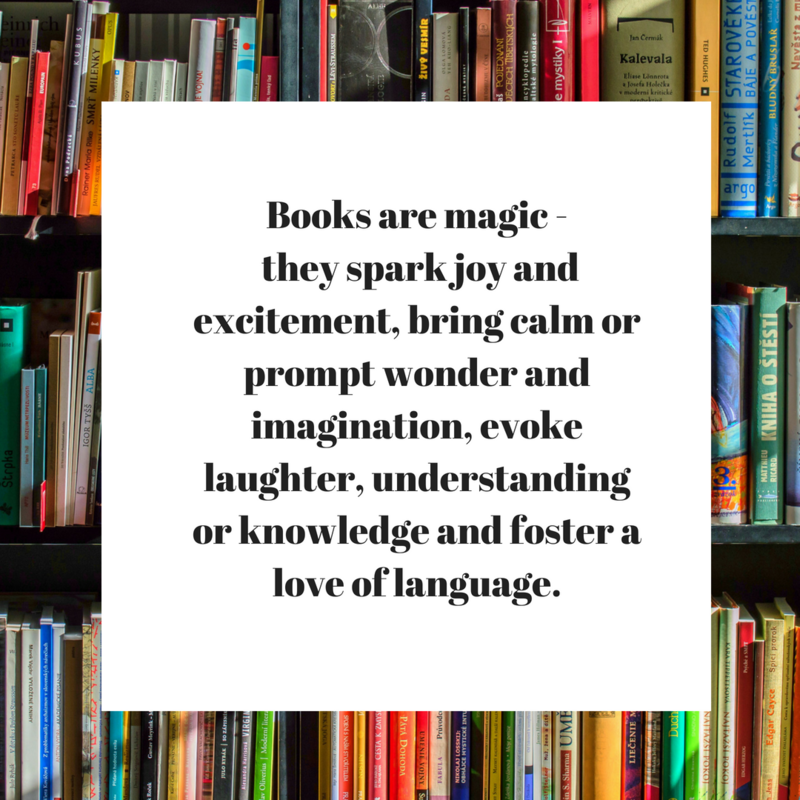 Books enter our children’s heads and spark joy and excitement, bring calm, or prompt wonder and imagination, evoke laughter, understanding or knowledge and foster a love of language. So, from a writer’s perspective, don’t you think it would be amazing to contribute a book to the world? To share some magic? To give a gift? Speaking of the world: let’s talk about Eric Carle, the author of The Very Hungry Caterpillar for a minute. Over 30 million copies of The Very Hungry Caterpillar are floating all around the world (WOW!) (Wikipedia (https://en.wikipedia.org/wiki/The_Very_Hungry_Caterpillar)). If you’re Eric Carle, you would have brought joy to millions of children and taught them about the caterpillars, cocoons and butterflies. I couldn’t wait to get home from school every day to fill out this book with my Mum. There’s magic in books. There’s magic in baby + me – for families, parents and children and I can’t wait to share it with more of them! And if you do one day choose to pick up a pen or a computer keyboard and write a story, know there’s plenty of time to get published – the winner of the Children’s Book Council of Australia Picture Book of the Year award 2018 announced last week was Gwyn Perkins. He was 76 at the time of writing and illustrating his book called A Walk in the Bush! Inspiring stuff! 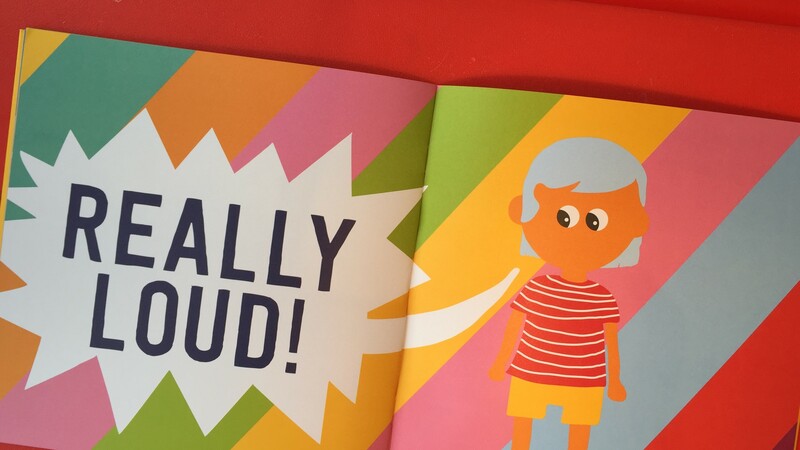 REALLY LOUD about baby + me! baby + me, a new and unique book for soon to be big brothers and sisters that helps prepare them for a new baby, has involved a number of “firsts” for Lauren Gardiner, the author of baby + me and creator of me mo books. Lauren talked about these firsts and why she wanted to be “REALLY LOUD” about them (which is not her usual style!) at the VIP Launch Event for baby me. Welcome to the Launch Event for baby + me. There have been a lot of firsts for me in this project and getting this book to print. The book in itself is a first. I made my first website. I had my first foray into social media (argh). Thanks to Tennille Wong for holding my hand with that! And I’ve made my first book sale! Debbie Isaac (consultant OT on the baby + me project) first suggested I needed to have a launch. Here I was thinking that a writer’s life was reclusive and behind the scenes and I could tap away happily at my keyboard in the comfort of my own home… Well, if I didn’t look aghast when Debbie made this suggestion, that’s definitely how I felt! And Tennille Wong, the publicist for baby + me, was right behind the launch thing too. I was warming to the idea of a launch (still feeling slightly sick about it, but warming to it). And then my eldest son (let’s call him “Little Mate” or “LM” for short) had his seventh birthday and received a bright orange bike. He rode it for the first time that day. The whole family was there to encourage him, Damien and I held the bike to steady him the first few times and gave him a few tips and our middle son (let’s call him “Dames”) gave us frequent updates on how many laps he’d done. “Gubby”, our youngest, was right into the clapping – she loves a good clap! And Damien and I felt so proud for days afterwards. In fact all our faces beamed with delight and pride at LM’s achievement! We’d also had a few other firsts in our family too around that time – Gubby’s first steps and first words and Dames’ first day at school and his first readers. two: how they are so exciting, not just for the person who achieves them, but for everyone connected too. But when you’re an adult and you’ve ticked the boxes on a lot of firsts, celebrated all the usual milestones (marriage, children etc), you might be inclined to celebrate with a nice quiet dinner, go away for the weekend, drink wine or eat cake. And perhaps we do the quiet thing because we feel like to do the loud thing is a bit self-indulgent, over the top or a bit “showy”. But … maybe being quiet about our firsts or other achievements as adults fails to truly acknowledge the nature of a first or an achievement – that they often involve a team effort and that they can bring so much joy to a lot of people around you – your friends and your family. So the Launch Event is to acknowledge and give thanks to the many people who have helped on the baby + me project (many just out of kindness and a desire to see my project come to life) and to share the celebration and the joy of bringing this little book into the world! My first thank you must go to Grace West, the illustrator and designer of baby + me. I think everyone would agree that each and every page of the book has been beautifully designed and illustrated. Grace, you have done the most wonderful job of illustrating and designing this book. I think it was incredible that your vision for this book really matched my own. I couldn’t believe how spot on those first draft images and pages were. I am so grateful for all the work that you have put in. I hope you are as proud of this project as I am. Secondly, thank you to Debbie Isaac. Debbie has given so much time to me and this project. You’ve become a mentor and a dear friend. In our first meeting you helped me to distil and to simplify the book – which is key for engaging with children (in fact we cut it in half!). Again, I think you had a vision for this book and it really matched my own. The partially completed pages are also a product of what you have taught me – that kids sometimes don’t cope well with a “blank page”. Next up is Fred Mayer from Adams Print. So … we started with a book with a middle page of stickers and scrapped that. Then we fiddled with paper stock and considered other sizes for the book. And as we were approaching the finalisation of the design, I threw in a “please can I have a spine?” request. None of these things were any trouble for Fred. Thanks for all your time, advice and your patience. And your spine solution is awesome! I’m so proud to be associated with a fantastic local Geelong-based printing company in Adams Print. Thanks to Tennille Wong – my publicist extraordinaire. Thank you for believing in this project. I am so incredibly fortunate that you put up your hand to help me with it. I’ve learnt so much from you and you have been prepared to get deeply involved in all aspects of the marketing and publicity campaign for the book. Thanks for holding my hand on my first Facebook and Instagram posts – argh! What fun it has been working with you! Thanks to my close group of friends, particularly mum friends that have reviewed versions of baby + me. You’ve also been my market research consultants, bounced ideas around with me on things such as business names, potential stockists and avenues for marketing. In particular, Susannah, Amy, Holly, Felicia, Tennille (again) and Jules. And through our pep talks in playgrounds and coffee shops you’ve kept me going and reassured me that my time has been well spent. Thanks to Chris McLeod, for providing me with some great help on the legal side. With any luck we should have trade mark protection on a couple of aspects of the project in the coming months! I’ve also got to thank Damien for suggesting that baby + me was worthy of publication and giving me the opportunity and the resources to take this idea forward. Thanks for staying up late playing with and testing the website e-commerce functionality and invoicing functions. And thanks for just being you! And of course to LM, Dames and Gubby. You are my inspiration for this book. I hope that through this book, which is based on our experiences as a family, we can help other families with new babies on the way. And to Mum, Dad and Rita for believing in me always and your love and support. And nothing happens in our family without the wonderful support of Jess, the ever caring and loving nanny to our three kids. Thank you Jess. I couldn’t have done this without you. Thank you to Emma Cogdon for the lovely baby + me biscuits and making some of my launch documentation look beautiful. You are an absolute star Em! Thank you to the ladies at Reunion Dining – Jan and Leith. You fill our bellies every Saturday morning with yummy brekkie and you’ve done it again today with some yummy nibbles and yummy bubbles for the launch. Thanks too for your support of my book project – baby + me is stocked in Jan and Leith’s Providence Melbourne store. And thanks for allowing me to offer local pick up for website sales there too! And thanks also now must go to all the newly minted “baby + me ambassadors” – everyone attending the launch! I’ve already had some great ideas for advertising and selling baby + me and some excellent social media posts and likes and shares! Thank you! And now for a REALLY LOUD cheers to baby + me! In the spirit of being “REALLY LOUD” and my new appreciation of firsts, let’s say cheers to baby + me and to all of you!